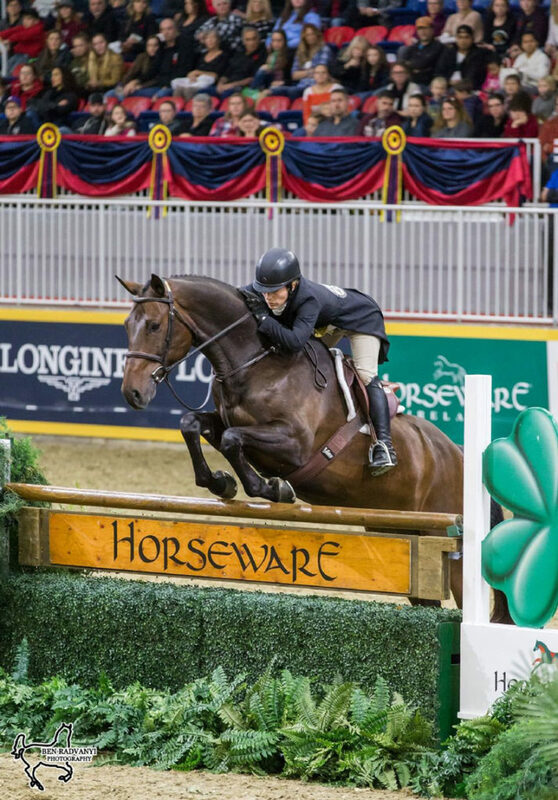 Isabelle Lapierre of Lévis, QC, rode away with the win in the $15,000 Braeburn Farms Hunter Derby, presented by Rosemary Phelan – Braeburn Farms, at the Royal Horse Show in Toronto, ON. When Lapierre and Carrera S, an eight-year-old Holsteiner gelding owned by Johannie Légaré, entered the Coca-Cola Coliseum as the final of 20 entries to contest the Rob Carey designed track, Erynn Ballard and Enchanted held the lead with an overall score of 100, including handy and high option bonus points. Lapierre and Carrera S not only bested Ballard’s score, they did so by a sizeable margin, earning a base score of 95 and a grand total score of 113. “It’s always a surprise when you get your score,” said Lapierre, a longtime Royal Horse Show competitor in both the hunter and jumper divisions. “I’m always the one, when I come out, I don’t really show so much emotion, because you never know what to expect. Then when they said 113, I was like ‘oh my God!’ I knew he was good, but not that good! It just all happens so fast. With Lapierre clinching the win, Ballard of Tottenham, ON, and Enchanted, owned by Christel Weller, took second, while third place with a score of 99 went to Kristjan Good of Campbellville, ON, riding Stakkato Grande W for owner Augustin Walch. Each of the horses in Sunday afternoon’s class qualified to compete in the event through the Canadian Hunter Derby Series, running throughout the season at horse shows across the country. Hunter Derby competition returns to the Coca-Cola Coliseum on Tuesday, November 6, with the $25,000 Knightwood Hunter Derby beginning at 7 p.m. The overall high point horse from both the Braeburn Farms Hunter Derby and the Knightwood Hunter Derby will be presented with the Lorna Jean Guthrie Challenge Trophy. The Royal Horse Show continues with amateur-owner and adult hunter competition on Monday, November 5, as well as the Jump Canada National Medal Finals and all-new Dressage Derby taking up the spotlight on Tuesday, November 6. The international show jumping division opens on Wednesday, November 7, featuring the $36,000 Jolera International Welcome in the evening session as anticipation builds for the $205,000 Longines FEI Jumping World Cup™ Toronto, presented by GroupBy, on Saturday night, November 10.